Gas prices across the United States have skyrocketed, with today's national average for regular unleaded gas at $3.51 a gallon, with California leading the pack at $3.90 a gallon. AAA reports that last week's national average was just $3.37. That's a $0.14 increase in just one week! Just one month ago, the average was $3.12. A year ago—$2.75 a gallon. 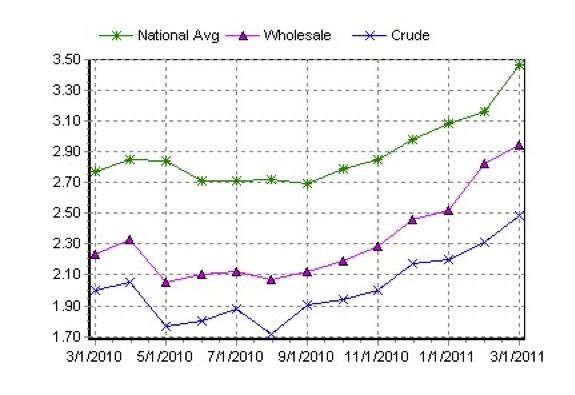 Actually, the U.S. Energy Information Administration (EIA) states the price of gas hasn't been this high since since 2008 when it hit $3.57 in April. The highest its been in the last 20 years was $4.05 in July, 2008. So, if you can stay off the road—do it—and save some money. If you can't, you can try and keep the cost at the pump down by A). improving your gas mileage on the road or B). finding the cheapest prices in town. 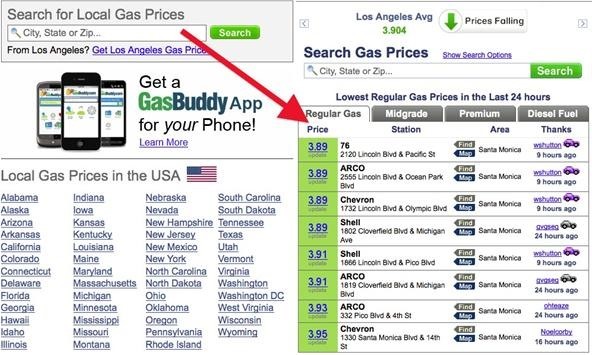 And one of the best ways to find the cheapest prices at the pump—GasBuddy. Their price charts (below) state roughly the same numbers as the EIA, and depicts the horrific increase over the last six months. GasBuddy.com works on a simple principle—to help you find the cheapest gas in town. They operate over 240 websites dedicated to helping you find the lowest gasoline prices, but the most helpful resource of all—YOU! To start saving, just go to their website and type in your zip code. It may not be the most aesthetically appealing site, but it serves its purpose. Once you've hit the search button, you'll see the best prices in town. And why are you the best resource? Because it's you, the everyday driver, out on the road reporting these prices to GasBuddy. Just create an account and with them and start pitching in! You just need to sign in to your account and submit prices, and the best way to do so is via their iPhone app (also compatible with iPod touch and iPad). With it, you can browse prices on the go or sign in to tell your fellow drivers the best gas prices in town. There's also an app for Android smartphones. You can also visit their Facebook and Twitter pages to contribute and stay up to date. Overall, this is a great concept. For the most part, the apps work great, but the only thing it should consider in the future is listing certain facts about gas stations, where the best price isn't necessarily the best price. The first gas station to come to mind—ARCO, who charges $0.45 each time you use a debit card.